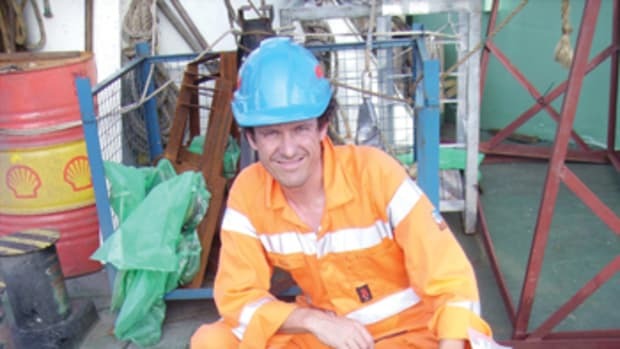 Treasure hunter, marine archaeologist or businessman? Articulate, energetic and clean-cut, Mark D. Gordon, Odyssey Marine Exploration’s 48-year-old president and chief operating officer, fits to a T what you would expect of a top executive of a publicly traded company listed on the NASDAQ. He is young. He is sharp. He is entrepreneurial. He knows his company. He knows its business. If you want to see credentials, he’s got an MBA in finance. Yet there is something different about Gordon. It seems to run in the DNA of Odyssey’s staff, starting with its founding partners, Greg Stemm and John Morris. It’s a kind of evangelical fervor about their work. He is a man on a mission. Gordon would never call himself a “treasure hunter,” though that describes what he does. It’s a dirty term today. But he is an avid shipwreck diver, a weekend hobbyist who has been exploring wrecks for fun since his college days. 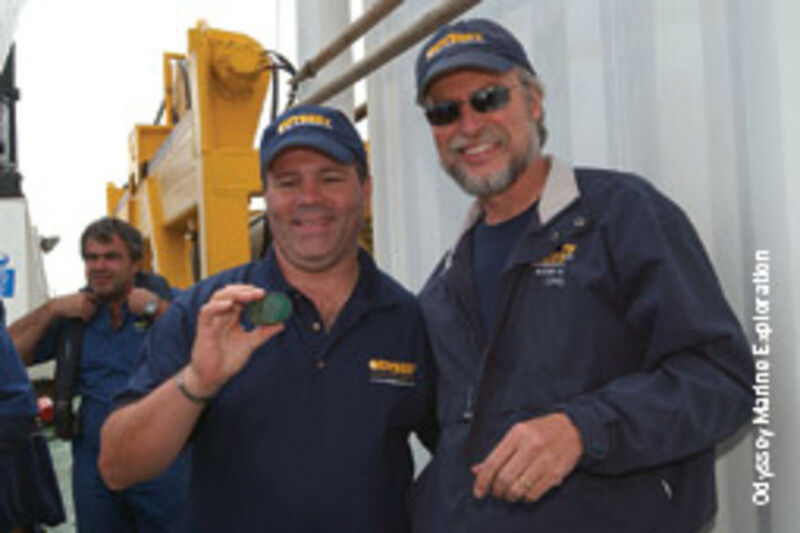 Now, as Odyssey’s president, working out of a nondescript building south of the Tampa (Fla.) International Airport, he is at the nerve center of a company whose deep-ocean shipwreck exploration and recovery operations have uncovered some of the biggest deep-ocean finds — and treasures — since Mel Fisher hit pay dirt with the 1985 discovery of the Atocha’s $450 million mother lode off Key West. • The Republic, a Civil War-era side-wheel steamship that sank off Georgia in 1865 and yielded 14,000 artifacts and 51,000 gold and silver U.S. coins — $75 million worth. • Black Swan, code name for what is believed to be the Spanish frigate Nuestra Senora de Mercedes, sunk off Portugal by a British warship in 1804. 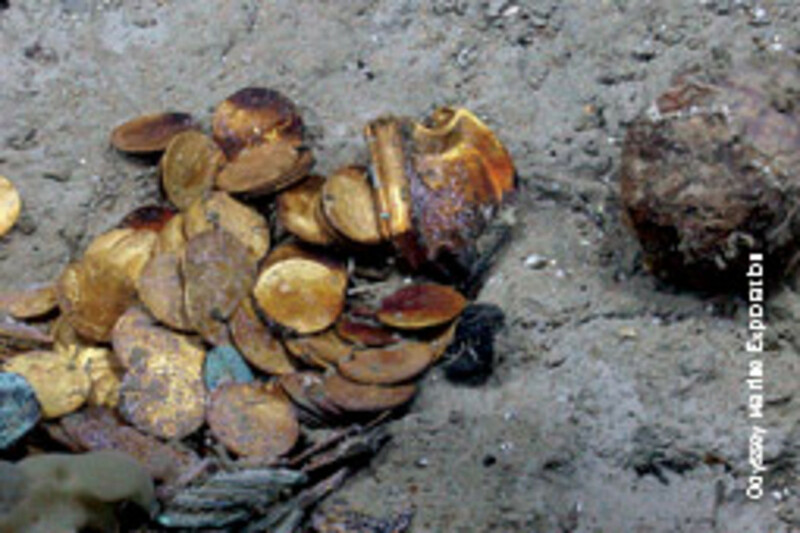 So far, it has yielded 500,000 gold and silver coins — an estimated $500 million worth, the biggest cache since Atocha. 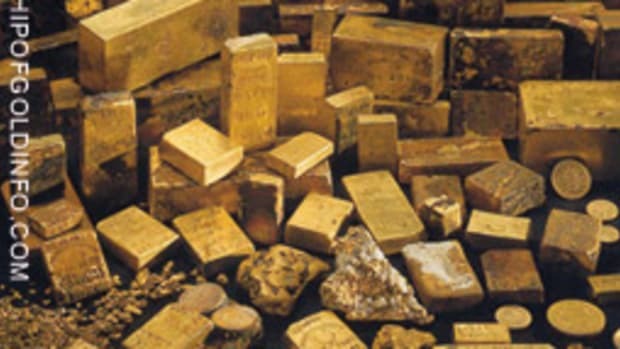 • HMS Sussex, an 80-gun British warship that went down in a storm off Gibraltar in 1694 with possibly 10 tons of gold — another half-billion-dollar haul if the gold is there and excavation proceeds as planned. Whether you call it treasure hunting or not, Odyssey has found more undersea treasure in the last five years than anyone else in the world and Gordon says that’s because it has a model that works for researching, finding and excavating deep-ocean wrecks. The company is super high-tech, which enables it to work deep-ocean bottoms to high archaeological standards. Odyssey is a public company (OMEX), which means it raises some of the enormous sums of money it needs to undertake the research, the ocean surveys, the excavations and artifact conservation by issuing stock that trades on the NASDAQ. Odyssey has brought treasure hunting into the 21st century and turned it from a “mom-and-pop” venture like the Fisher family’s Treasure Salvors Inc. into a savvy, methodical and highly efficient corporate juggernaut. Odyssey’s successes have not endeared it to those who see the corporatization of treasure hunting as just a more sophisticated way of looting our undersea heritage. In the world of non-profit archaeology, profits are seen as a contaminant, a spoiler. Some of the profit from the treasure it sells goes to stockholders and some is plowed back into the company to fund new projects. Gordon says Odyssey only sells items that are found in large quantities; unique pieces are retained for scholarly study and/or public exhibition. And, Gordon says, Odyssey is as good or better than academia at mining the wreck sites for archaeological and historical knowledge, sharing its findings widely and doing archaeological mapping, excavation and artifact conservation to state-of-the-art standards. “Archaeology and business can exist together in a way that is good for everybody,” he says. Gordon says he is in the business of deep-ocean shipwreck exploration and recovery — emphasis on business. He’s a businessman. He doesn’t claim to be a marine archaeologist, but some of his staff are, and he often brings in world-renowned archaeological experts to help on projects. 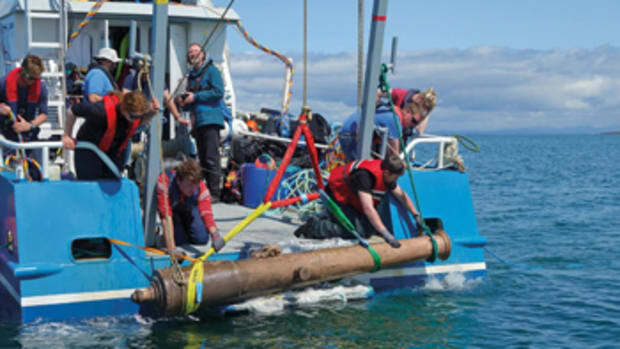 In Gordon’s view, and in the views of founders Stemm and Morris, this is the cutting edge of marine archaeology, the best and perhaps only way to begin finding and saving some of the thousands of wrecks Odyssey estimates are on the bottom of the world’s oceans and bringing their secrets to public light. He says neither government nor academia has the money to fund large-scale exploration and recovery. Using underwater robotics, Odyssey between 2000 and 2008 has spent 9,000 hours mapping 10,000 square miles of ocean bottom, and has discovered 300 shipwrecks, from third century B.C. Phoenician sites to German U-boats and modern-day fishing vessels. “We are confident we could map the entire seabed [except its deepest trenches] in our lifetime,” he says. What has made this level of exploration possible is Odyssey’s ability to raise money from investors, its long-term commitment to costly historical research, and its willingness to adopt the latest deep-ocean technology from the military and the oil, gas and trans-oceanic cable industries, Gordon says. 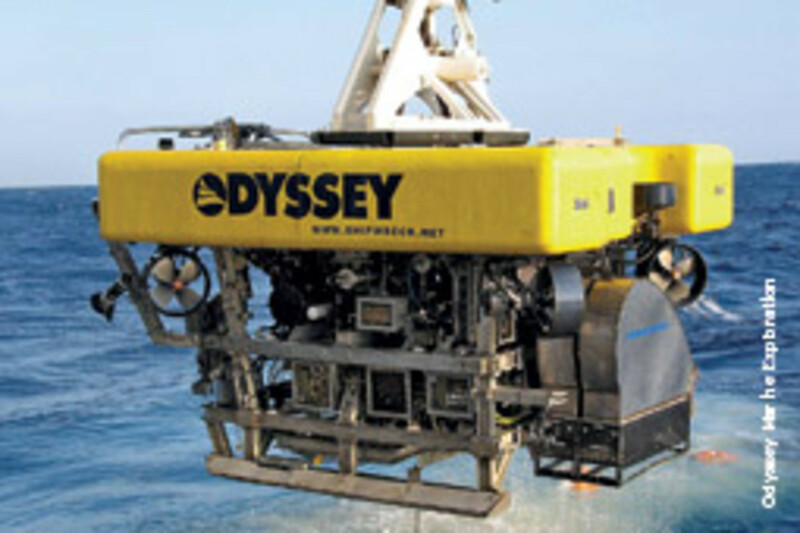 Odyssey has its own 251-foot research vessel, Odyssey Explorer, and its exploration teams use side-scan sonar and magnetometers to survey the ocean floor for anomalies, and two 8-ton remotely operated vehicles — Zeus I and Zeus II — to assist in photographically mapping and excavating wreck sites. About the size of a Hummer and driven by eight hydraulic thrusters, the Zeuses are capable of operating to depths of 8,200 feet. They carry precise acoustic positioning gear, lights, video cameras, and have two arms that lift objects weighing as much as a man. The arms are equipped with suction-cup like devices that can pick up artifacts as tiny as a coin. Before excavation begins, Zeus maps the sites in detail with still cameras, stitching thousands of high-resolution images into a photo mosaic. During excavation, it uses sound waves from transponders planted on the wreck site to identify exactly where — in three dimensions — every artifact is recovered and records it on a grid map. Meanwhile, video cameras record the entire operation. A proprietary sediment filtration system channels mud or sand into a collection and filtration chamber to capture tiny artifacts such as buttons, fragments or seeds, again recording where they were found. Shipboard technicians watch what’s going on thousands of feet below on video screens and direct Zeus’ excavation work under archaeologists’ supervision. 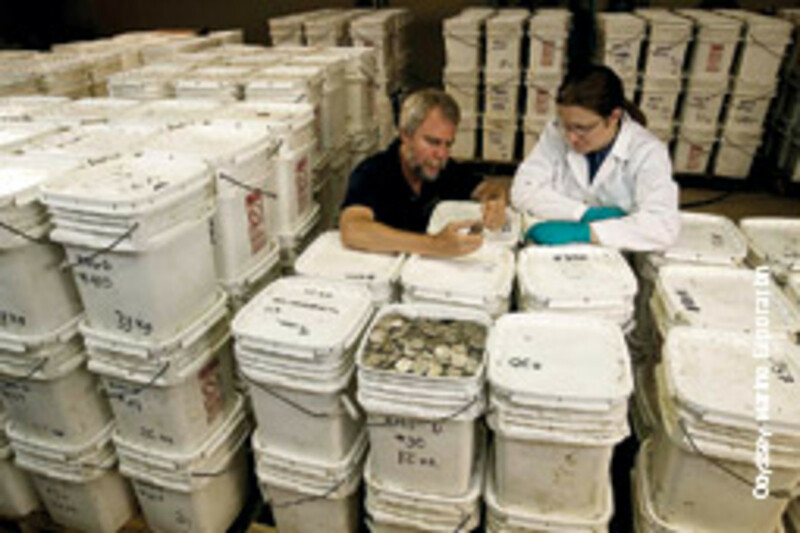 Once on the surface, artifacts receive “first-aid” conservation, then go to a lab in Tampa for further treatment, and for analysis, study and documentation. As sophisticated as the technology is, it is the business side that keeps it all humming, Gordon says: the investment in Odyssey stock; sale of coins, bottles, jewelry and artifact fragments; marketing of books, videos and traveling exhibits (“Shipwreck! Pirates and Treasures”) telling the stories of the ships, their demise and their discovery; and joint ventures with National Geographic (“Civil War Gold,” an hour-long PBS special about the Republic), the Discovery Channel (“Treasure Quest,” a 12-episode series about Odyssey’s shipwreck explorations), and Disney’s Magic Kingdom (its “Pirates and Princesses” event). This cutting-edge commercial model for exploring, recovering and marketing shipwrecks has been blunted by a movement to prohibit buying and selling undersea treasures and artifacts, and to keep deep-water wrecks where they are. The UNESCO Convention on the Protection of the Underwater Cultural Heritage — adopted in November 2001 and which took effect Jan. 2 — encourages preservation of shipwrecks where they are; authorizes recovery of artifacts only if they make a “significant contribution” to protecting the underwater cultural heritage or advancing knowledge about it; and prohibits buying, selling or “irretrievably dispersing” artifacts. Gordon thinks the convention is misguided because it drives out “responsible” operators like Odyssey while leaving the wrecks to be ravaged by looters, trawler nets and the elements. The academic community has embraced the United Nations convention with gusto; the nations of the world have been less enthusiastic — only 23 have ratified it. 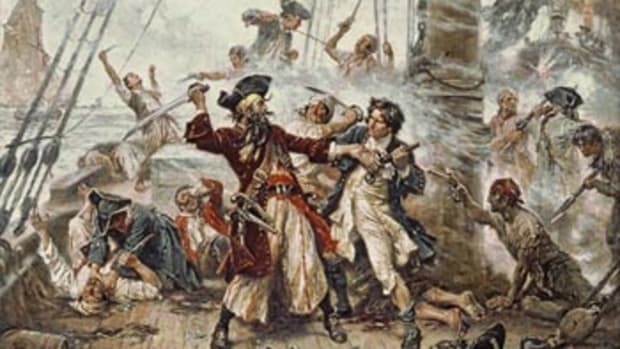 Among them is Spain, which has challenged Odyssey’s claim to the Black Swan treasure in U.S. District Court in Tampa and delayed excavation of the Sussex, which lies off Gibraltar. The United States hasn’t ratified the convention, nor have Great Britain, France, Germany, Italy, Russia or China. The Institute of Nautical Archaeology’s Delgado says the U.N. convention attempts to protect our undersea heritage from the kind of greed that led to the plundering of Egypt’s pyramids and the theft of priceless artifacts. He recounts case after case of looters diving on wrecks and making off with important artifacts that now are lost, or inept salvors damaging wrecks or the artifacts found in them, or of treasure hunters savaging a wreck site seeking gold and silver that wasn’t there. But what about an outfit like Odyssey that tries to hew to a higher standard? “If you’re looking at the bottom line, you’re just looking at stuff that glitters and doesn’t cost that much to treat [conserve],” Delgado says. “They’re not going to spend 11 years meticulously exploring a ship like the Uluburun,” the world’s oldest known shipwreck, which sank off Turkey around 1350 B.C. and has yielded glass, copper, tin, ivory, ebony, amber, ceramics and gold from 12 ancient cultures. Delgado says shipwreck exploration isn’t about finding things, or selling or owning them. It’s about discovering knowledge, he maintains. It’s about using that knowledge — and the artifacts — to re-create the past so people can connect to it and understand it better. He argues passionately for keeping all artifacts found at a wreck site together for study and education, and not selling them and dispersing them. Anything less than that is selling out our cultural heritage, he says. Gordon agrees that mining and sharing the knowledge from these wrecks and telling the stories of the people who built and sailed them and used them in commerce is important. But he sees no point in warehousing large quantities of duplicate, mass-produced cargo and trade goods. He says selling that material off results in no long-term loss of historical or archaeological knowledge. “Each of these [wrecks] is a time capsule,” he says. Each has a unique story to tell. “What I’m most passionate about is those stories.” Odyssey tells them in books, DVDs, exhibits and articles that educate and also bring in income. Where Gordon doesn’t get much chance to tell these stories is in professional journals. Most won’t accept Odyssey submissions because it does archaeology for profit. Gordon, who has managed or owned four start-up companies in data communications, won the Ernst & Young Entrepreneur of the Year Award in 1999. He sold his most recent start-up, Synergy Networks Inc. of Vienna, Va., to the Rockefeller Group in 2003, then was named president of Rockefeller Group Technology Services Mid Atlantic. 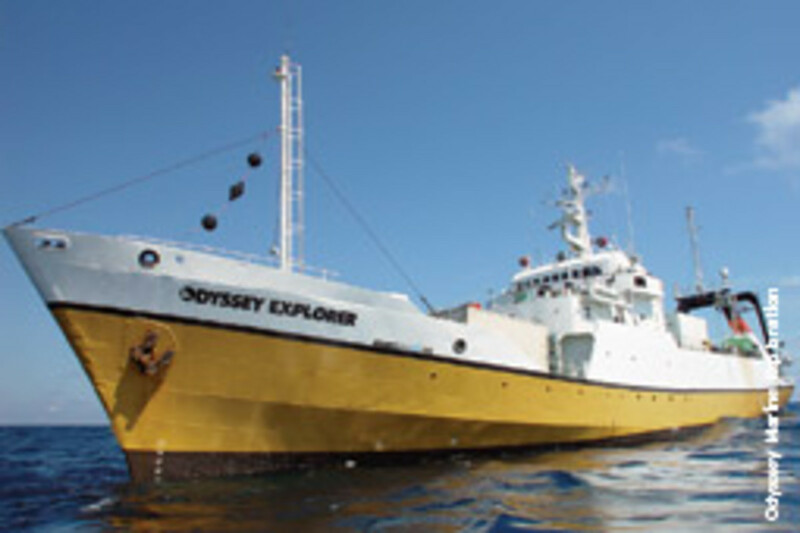 Two weeks after selling Synergy, Stemm asked Gordon to help design and install the data systems on Odyssey Explorer. Two years later, Gordon joined Odyssey as director of business development. 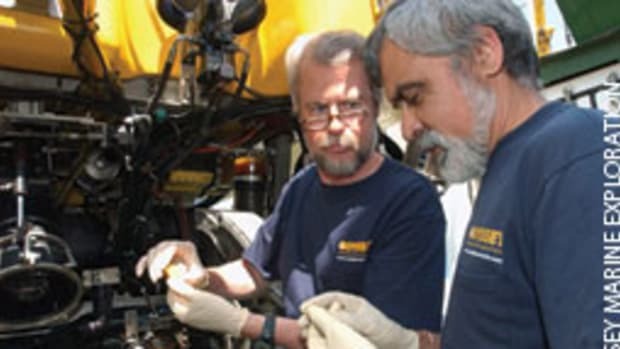 A long-time fan of undersea explorer Jacques Cousteau, he says it was a “childhood dream come true.” Gordon was so taken with shipwreck exploration that in 1980 he wrote up a business plan for an operation like Odyssey, but he canned the idea after concluding it was too risky and capital-intensive. The jury is out on whether that’s still true or not. 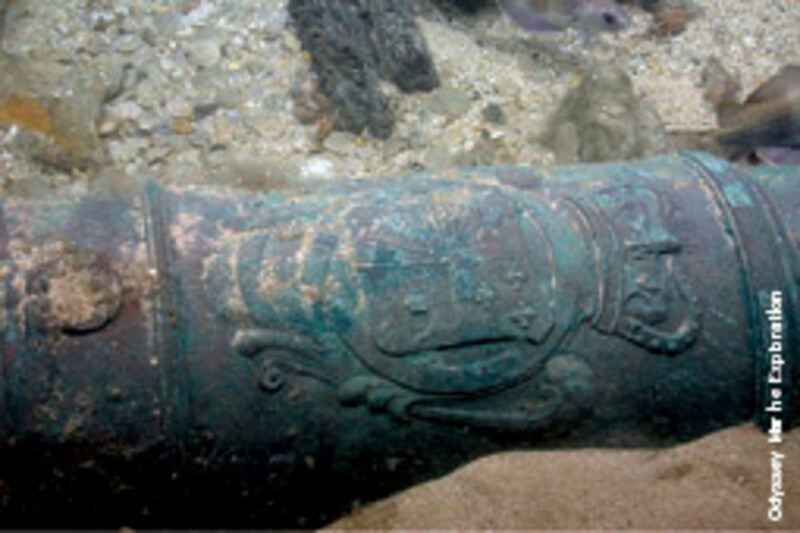 Odyssey lost $24.8 million on $4.1 million in revenue in 2008, but it still has 31,000 silver coins from the Republic to sell; has claimed salvage rights to the treasure on Black Swan, HMS Sussex and the ship believed to be HMS Victory; and has filed admiralty court claims on several other wrecks. Odyssey is in court with Spain over Black Swan. 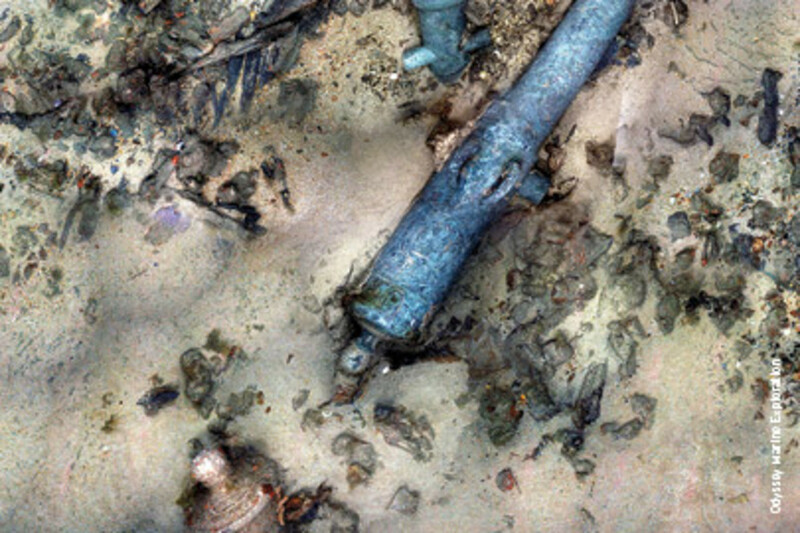 The Spanish are claiming 100 percent ownership of the wreck, its artifacts and treasures. The company has reached agreement with the British government to excavate Sussex, turn over all the historically significant artifacts to the government, and share the booty with the British. Odyssey still was negotiating with the British for excavation rights to HMS Victory. That is, turn treasure into dollars — and into dividends for Odyssey investors. 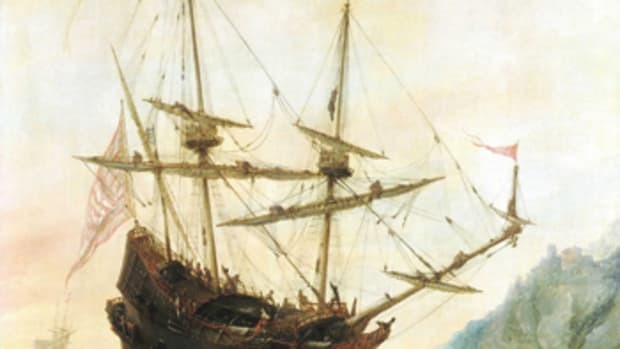 Was Columbus a double agent?